Making homemade fries is always so much fun. Why not switch it up and make fries with another vegetable other than potatoes? One of my favorite non-potato fries recipe is made with parsnip. They become soft and tender in the oven after baking and crispy on the edges, and the flavor is very unique. I first prepare an herb, garlic and olive oil mixture in the Magic Bullet and then toss the thinly sliced parsnip with it in a mixing bowl. Then, I bake them in the oven. They are best hot right from the oven. Add the olive oil, garlic, salt, pepper and herbs to a small Magic Bullet cup and blend until well mixed. Toss the olive oil mixture with the parsnip in a large mixing bowl and spread out onto a baking sheet. Bake in the oven for 40 minutes, until tender and starting to brown on the edges. Making piña colada from scratch at home is very easy and adds a flavorful touch to a classic fruit salad recipe. All you need is some coconut milk, pineapples and pineapple juice to make the non-alcoholic piña colada mix. Then, toss it with some chopped fruit and mint to create a refreshing fruit salad everyone will love! Add the coconut milk, pineapple juice and frozen pineapple to a Magic Bullet blender and blend. Toss the blended piña colada mix with the fruit and mint in a large bowl and chill until ready to serve. Every time I go to the grocery store I buy chickpeas because they are one of my favorite beans to cook with. I love to roast them, serve them in soups, add them to tacos, salads, and now…guacamole! I used my favorite healthy crackers and made a lunch of out it! Super filling and full of all the right nutrients that this busy mama needed! Turn on your broiler. Add 1/3 of the beans to a baking sheet. Spray lightly with cooking spray, then sprinkle salt, pepper, paprika, and cumin on the chickpeas. Broil in the oven until crispy, watch carefully. Remove from the blender, mix in a sprinkle of salt, 1/4 tsp. each of pepper, paprika, cumin, and chili powder. Adjust spices if needed. Fold in cilantro, top with roasted chickpeas, and enjoy! Keeps sealed in the fridge for 2 days. What is the best way to use leftover mashed potatoes? I would argue for these easy potato flatbreads! They go great with dips, or you can use them for wrapping fresh vegetables and sauce. You will need a cast iron skillet to cook the flat bread once it is rolled out. I like these potato flatbreads plain, but you could also add fresh herbs, garlic, etc. For this recipe, I start from preparing the mashed potatoes. If you already have leftover mashed potatoes, you are steps ahead! Boil the potatoes in a pot of water for 25 minutes, until tender. Add the milk, butter and salt and potatoes to a Magic Bullet cup and blend. Combine the mashed potatoes and flour in a bowl and knead with your hands for 5 minutes. Divide the dough into 4 balls, and roll out on a floured surface. Cook a few minutes on each side in the skillet until it starts to brown. What is it about sweet potatoes and cinnamon that makes them such a great pair? This mashed sweet potato recipe is very easy with the help of your Magic Bullet. First, cook them in a pot with some butter, salt, milk and cinnamon. 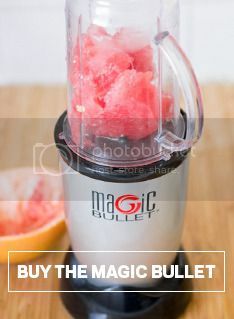 After allowing them to cool off, let your Magic Bullet blend them to the perfect creamy consistency. Add all ingredients to a pot and heat over low heat for 40 minutes, stirring occasionally. Cool to room temperature, then add to a Magic Bullet pitcher and blend until creamy. When you ask most people who they don’t like cauliflower, they respond that it is flavorless. To me, this makes it the perfect canvas for flavor. This sweet sesame cauliflower is a delicious side dish that goes great with Asian-style meals. Toss it into a stir fry, or eat it by itself on the side. You can double the sauce recipe for a saucier dish, or keep it light with a touch of sweet sesame flavor. Grease a baking sheet with oil and lay the cauliflower florets on top. Bake for 10 minutes. Add all remaining ingredients to a Magic Bullet cup and blend well. Add the cauliflower to a skillet over medium heat and drizzle the sauce on top. Although falafel is usually deep-fried, I came up with a delicious baked alternative using cauliflower as the base. This may be one of those “I don’t believe it til I try it” recipes, but take my word for it that these baked cauliflower falafel are going to knock your socks off. I like to serve them over a bed of greens alongside some carrot and hummus for a tasty, healthy lunch. Add the cauliflower to a Magic Bullet pitcher in sections and pulse to “rice” the cauliflower to small grains. Transfer to a bowl and set aside. Add all remaining ingredients and blend, followed by the cauliflower. Add more bread crumbs if needed to get to a sticky, yet holdable texture. It is ok if the batter is a little runny, as long as it can just barely form a drop on a pan. Drop tablespoons of batter onto a pan lined with parchment paper, forming mounds. Bake for 18 minutes, then turn the falafel over and bake another 18 minutes. The classic potato salad can be made with an overwhelming amount of mayonnaise, and while that can taste great, it’s a heavy dish that doesn’t agree with all diets or taste buds. The spin in this recipe is replacing the creaminess of the mayonnaise with an avocado – a much healthier and lighter version that retains the classic texture and adds refreshing flavor. For added kick, we’ll be blending in some dill, as well. Cut potatoes into halves and quarters. Dress with oil, salt and pepper, and bake in the oven for approximately 20 minutes on 400 degrees (or until brown), stirring occasionally. While potatoes are cooking, peel garlic clove and blend in the Magic Bullet. Add fresh dill, oil, lemon, avocado, salt and pepper to the garlic in the Magic Bullet and blend until creamy. Place browned potatoes in mixing bowl and toss with avocado dill sauce. Now you have a unique and delicious treat to liven up any dinner party, lunch party or picnic! Homemade tortillas are the best! They taste so fresh compared to store-bought tortillas, and don’t have any preservatives. You can make a larger batch and freeze them for later use, too. My toddler is a bit of a picky eater, and doesn’t like to eat vegetables. I try to sneak them in any way I can, and these spinach tortillas are just one example. Fresh spinach is puréed in the Magic Bullet, then mixed with flour and olive oil to create spinach tortilla dough. The dough is then rolled and heated in a skillet until cooked (you can tell it is done when brown spots appear). Keep them warm in a tortilla warmer until all are cooked and ready. Add the spinach and water to a skillet and cook over medium heat until the spinach is wilted (about 5 minutes). Stir occasionally. Blend the spinach in a Magic Bullet cup until puréed. Combine the spinach, olive oil, flour and salt in a mixing bowl and knead with your hands until a dough forms. If it is too dry, add a little more water. If it is too sticky, add more flour. The dough should be elastic, but not stick to your hands. Chill the dough in the refrigerator for 15 minutes. Break the dough apart into 6 equal circles. Roll out each circle on a nonstick surface and heat on a skillet over medium heat on each side until brown spots appear.